Identify the location and orientation of the the Mystery Foto and the Motor Parkway bridge. Which Vanderbilt Cup Races courses, if any, included this bridge? The course for 1908 Vanderbilt Cup Race was the only time this bridge was used as part of the course. As noted by Steve Lucas, this Mystery Foto was taken on October 1944 as indicated somewhere on the website trainsarefun.com . Congrats to Ron Ridolph, Steve Lucas, Al Velocci Joe Oesterle, Jim Waechtler, Frank Femenias (see Femenias' Findings), James Muldoon, Tim Ivers, Greg O., Art Kleiner (see Kleiner's Korner), Michael LaBarbera annd Frank Mendyk for identifying the Bethpage location. 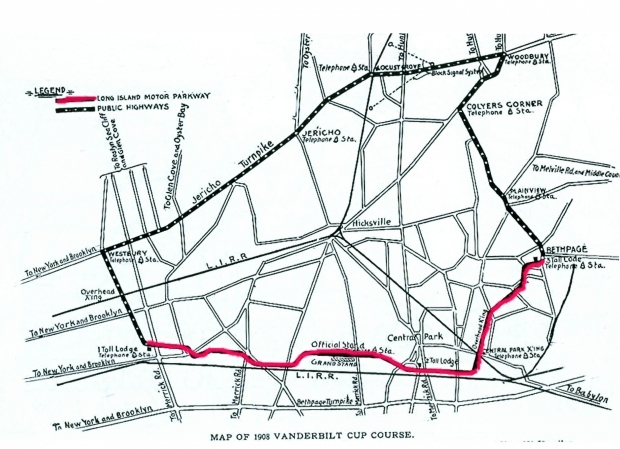 Kudos to Joe Oesterle, Jim Waechtler, Tim Ivers, Art Kleiner and Frank Mendyk for recognizing that the Central Avenue/LIRR Motor Parkway Bridge was only used for the 1908 Vanderbilt Cup Race. The sign on the building on the left say "Kessler", even though it looks like Hessler. The building on the right side of the tracks on Broadway is still standing. Fun Fact: The roof on this Bethpage building was the roof of the hangar for the Long Island Aviation Country Club in the Hempstead Plains. It was rebuilt at this location around 1950 after the Mystery Foto was taken. 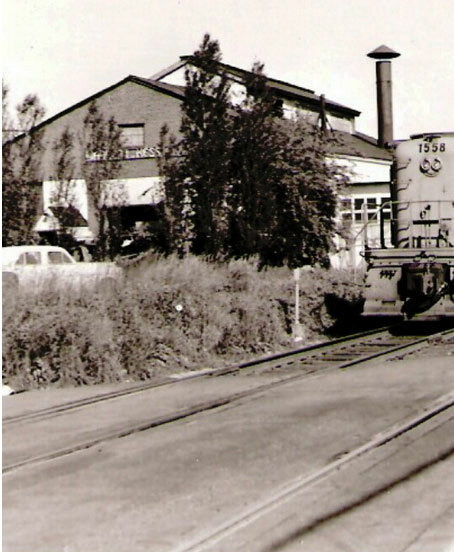 The building on the left side of the tracks in the Mystery Foto was the Kessler Glass Works. A historic marker and a CVS pharmacy store are now on the site. The 1908 course included the Central Avenue/LIRR Motor Parkway Bridge. The photo is looking east-southeast along the mainline of the LIRR from the Bethpage station (Broadway in foreground) with the LIMP bridge over Central Avenue and the LIRR in the distance. 1908 was the only Vanderbilt Cup Race that ran over this bridge. According to the website http://www.trainsarefun.com, the photo was taken in October, 1944. However, looking at the car on the right side of the photo, it could be a bit later. Liking the mystery foto, but were going away on vacation. Have fun with it, all! The LIRR only passed over the LIMP in three places. Pictured above is Broadway & the LIRR in Bethpage. The view is southeast towards the Central Ave crossing of the LIRR. Even from a distance, you can see this steel bridge is longer in length than the other crossings in Albertson & Mineola. It served the 1908 VCR, and according to LIRR records, was removed in 1950. It’s the crossing of the LIRRR & Broadway in Bethpage, looking east-southeast toward Farmingdale. The building to the right is still there. The car in front of it looks like a late 1940s model. Dating the car will help get the year, as will knowing when the gates were no longer raised & lowered by hand (which was probably done by the guy standing by them). I believe those gates were still manual in 1958 when I moved to Bethpage, but changed to automatic (both there & at Stewart Ave) not long after that. The bridge (#12 on the maps on this site), just north of “Deadman’s Curve”, crossed over both the LIRR and Central Av. It had to have been used in the 1908 race, and any other race that included Bethpage & Old Bethpage. The LIRR insisted the bridge be made of steel. Mystery Foto # 13… Going out on a limb I will photo shows the bridge over the Motor Parkway in Mineola and East Williston/Williston Park. Some of my research is falling flat so it could also be in Hicksville. I want to say we are standing west of the bridge looking east. The Vanderbilt cup race in 1906 included this bridge. Photo taken in October of 1944… maybe. Another great mystery photo, thanks Bob! Mineola, Albertson, and Bethpage. We’re at the latter on Broadway and the LIRR looking SE towards the Central RR bridge. The two buildings on the right are still standing today. 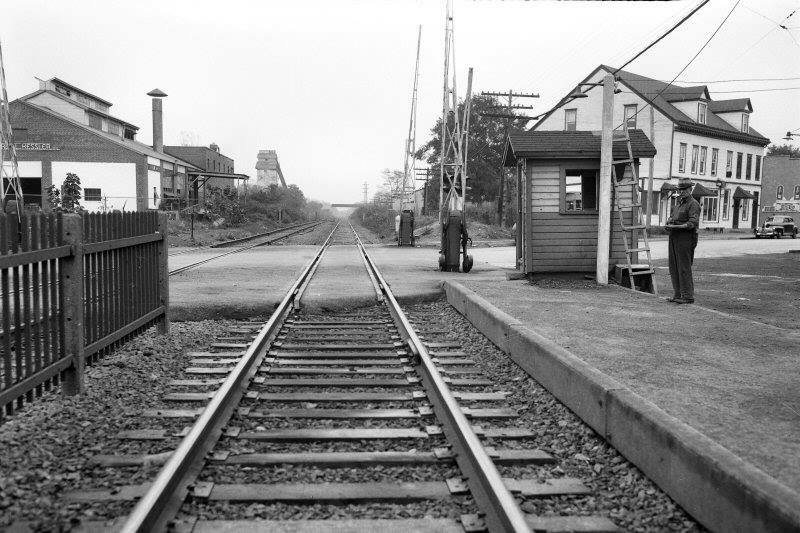 The buildings on the left are all gone, as is the crossing gate booth and the fence between the RR tracks. Bridge was taken down around 1950. The car in the photo is late ‘40s. A car expert can close in on the year of the photo. Cool pic. I’m going to guess LIRR bridge Williston Park / East Williston. I’m pretty certain it’s not the Mineola RR bridge - there was no station that close to it. 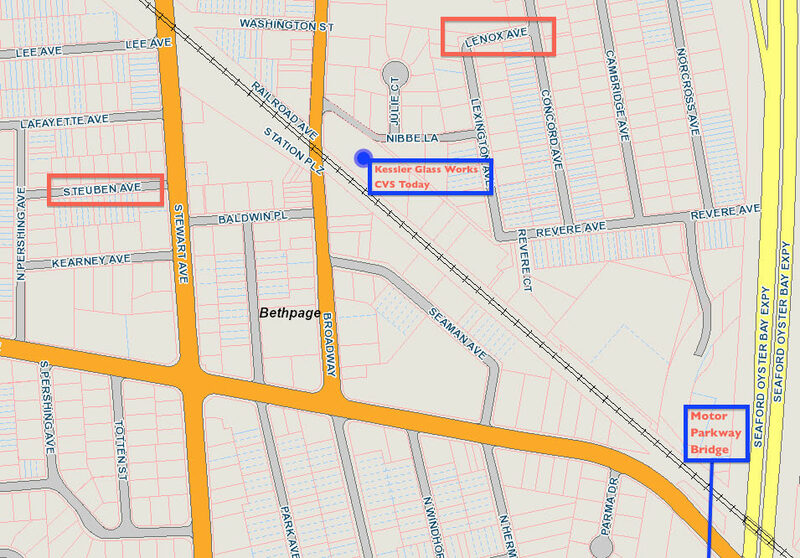 And the other option is Central Ave in Bethpage and I believe the same is true there….no station nearby so Williston it is. I’m sure that “HESSLER” sign on the building to the left is some sort of clue but I have no idea and dont feel like researching that stuff! Looking east access Broadway in bethpage, the Hayes in is the building to the right.the buildings to the left burned down and now it is a CVS. 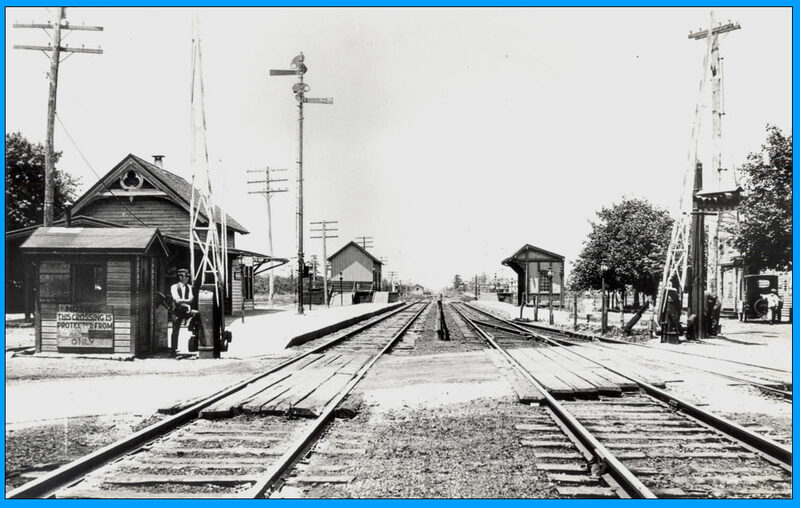 This was taken from the old location of the bethpage train station, now it is one block West on the other side of Stewart avenue. If you would to go about a half mile east where Central avenue and the LIRR meet the old motor parkway was ended under the “LILCO” wires. Oyster Bay line of LIRR at the east Williston station on 25B or hillside avenue or east Williston ave. The picture is looking north towards the Motor parkway bridge crossing the same branch line between Willis ave and Roslyn rd, cira 1935. I do not believe any Vanderbilt cup races ever used this bridge. It was built later. 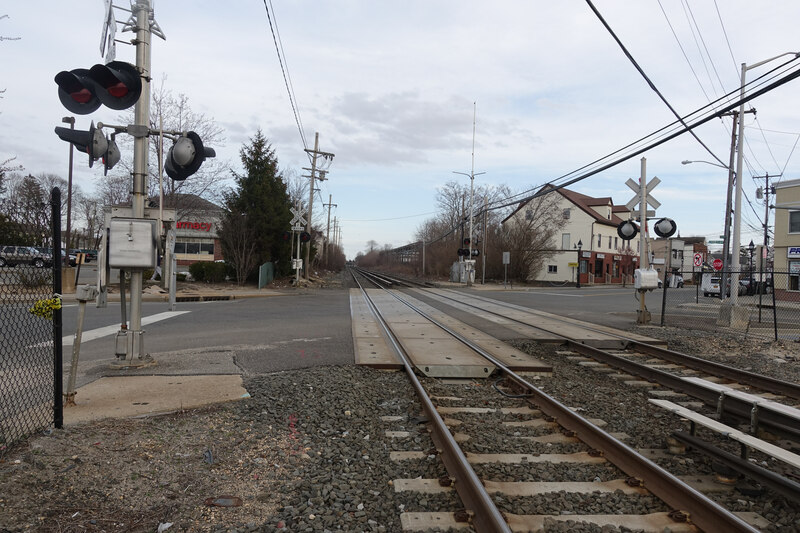 Looking east from the Central Line rail crossing, Bethpage. In the distance is the LIMP bridge over Central Avenue. The 1908 Cup race utilized this bridge. The building on the left was the Kessler glass factory. 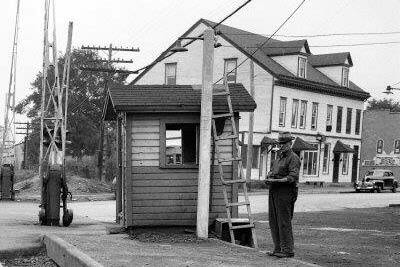 Estimated date, using auto in front of Colonial, 1946. -Identify the location and orientation of the the Mystery Foto and the Motor Parkway bridge. Looking East down the tracks at the Mineola railroad bridge. -Which Vanderbilt Cup Races courses, if any, included this bridge? Judging by the car on the right, I’ll guess sometime in the 1940’s. Central Park (Bethpage) looking east across Broadway. Central Avenue bridge. Somewhere between 1941 - 1950 (after completion of the Kessler Glass Factory and and bridge being demolished). 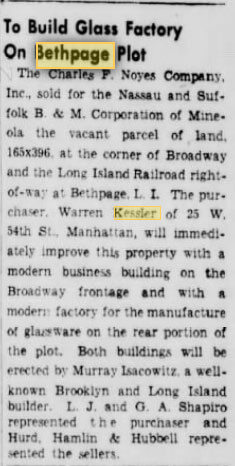 Additional entry - The Kessler Glass Works shown next to the railroad crossing in the mystery photo was originally a pickle factory. 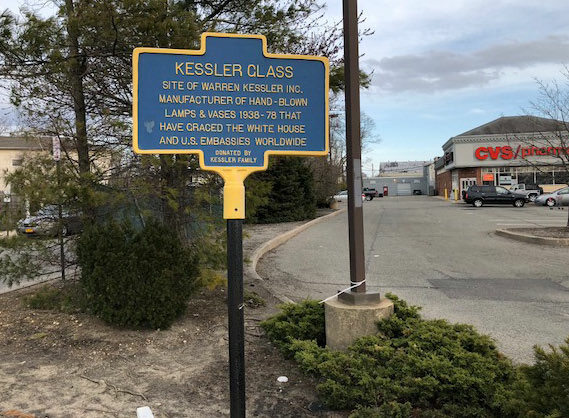 Warren Kessler moved his NYC based business to Bethpage around 1940 and the glass maker became world renowned being in existence until the early 1980s. The location is now a CVS (what else?). Interestingly, two nearby streets bear the name of two other famous glass makers - Stueben and Lenox. 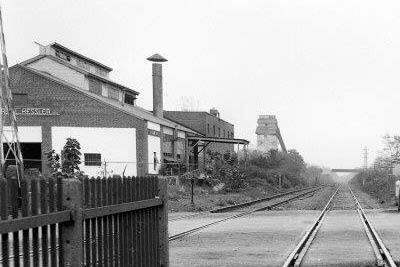 Looks like Bethpage RR Station facing East Toward Central Avenue Motor Parkway Bridge in the early 1940s based upon the car by the house. Used in the 1908 to 1910 races this was just north of the Deadman’s Curve. I believe this is the Oyster Bay LIRR branch looking north from the Hillside Avenue crossing at the East Williston station,the LIMP overpass up ahead. Not sure of the year but I bet Hillebrandt’s was already open for business three blocks to the west. 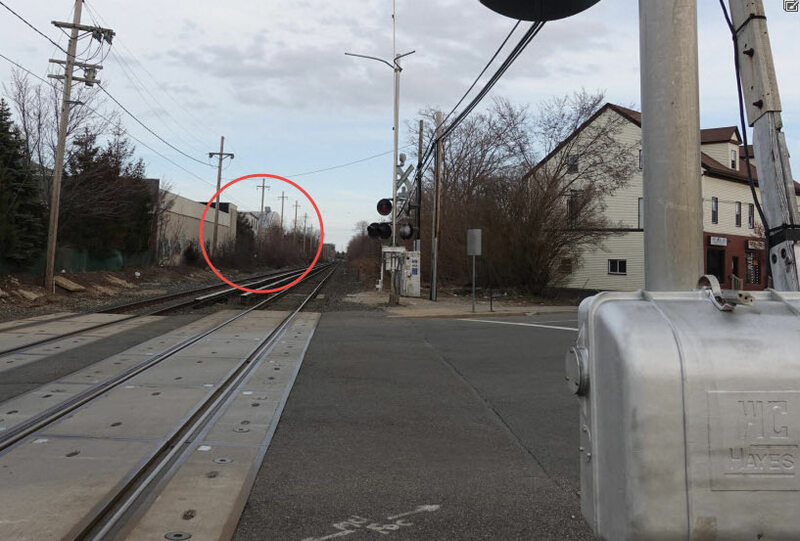 The location of the photo is at the old LIRR Bethpage Station. 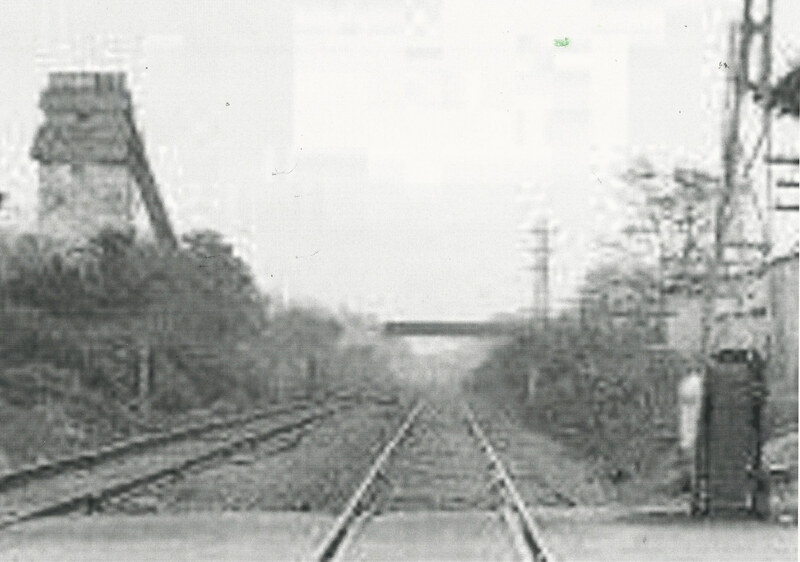 The photo is at the east end of the station at the Broadway crossing looking east towards the LIMP bridge. The 1908 Vanderbilt cup race course went over this bridge. The year of the photo I would say would be the late 1930’s to early 1940’s in reference to the auto parked on Broadway. Saying this track is on the “Central Line” (as above) is misleading and technically incorrect. 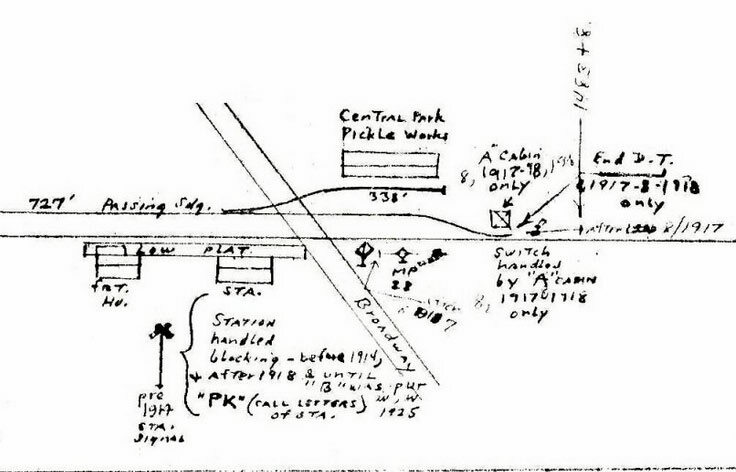 The Central line ran about 3/4 mile south of these tracks—VERY close to the LIMP. These tracks are correctly identified as being on the MAIN line. 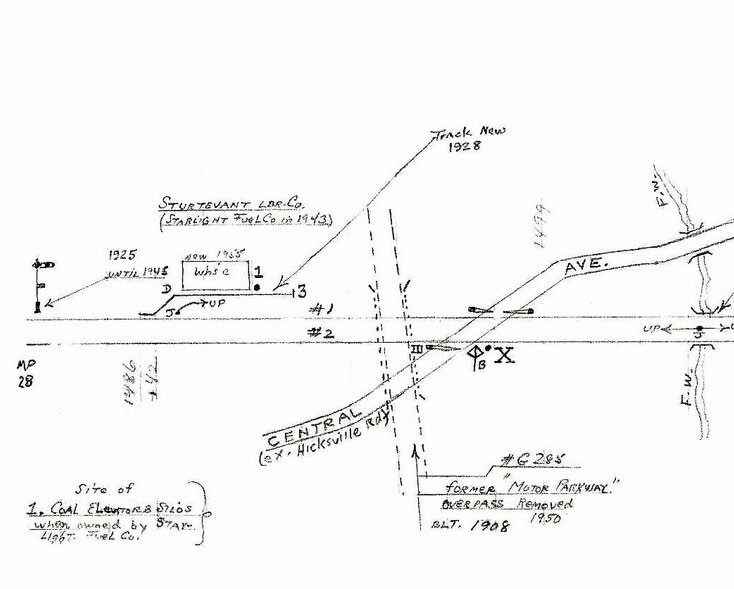 There was an intersection of of the Main Line and Center Line very near the LIMP overpass.